Over the past 15 months, no pitcher has started more games for the Reds than Tim Adleman. While that sentence alone tells you pretty much everything you need to know about the ongoing state of the rebuild, this is not an attempt to question the decision-makers who sent a 29-year-old who’s rarely mentioned as a potential contributor to the Next Good Reds Team to the mound every fifth day during that time frame, rather than a heralded prospect. Nor is this an attempt to critique Adleman’s performance. On the contrary, this post is intended to serve as a digital tip of the hat to a pitcher who took his lumps for an exceptionally lumpy team over the past two years, and more importantly, who remained healthy enough to keep coming back for more. Most readers of this site will likely agree that wins and losses are a poor way to measure a pitcher’s performance. Still, in the 32 games Adleman has started for the Reds since May 1, 2016, the team’s record was 13-19 (.406). In that same span, the team’s overall record going into August 2 Ã¢â‚¬â€œ when Adleman was seemingly demoted Ã¢â‚¬â€œ was 103-142 (.420). On the surface, this implies Adleman performed at a level slightly below the average Reds starter, but that assumes such a category of pitcher has existed over the past two seasons. Simply put, it hasn’t. Over the course of the 2016 season, a whopping 15 different pitchers started for the Reds. Of those, the leading workhorse, Dan Straily, was traded during the offseason, while Brandon Finnegan Ã¢â‚¬â€œ who started as many games as Straily last year (31), but threw 19 1/3 fewer innings Ã¢â‚¬â€œ spent much of 2017 on the disabled list. Finnegan’s injuries were primary reasons why the Reds leaned so heavily on Adleman again this year, when 14 pitchers (and counting) have started for the team. Once you account for overlap, you’re left with a total of 24 different Reds starters over the past two seasons Ã¢â‚¬â€œ a far cry from 2012, when the team had five pitchers who started 30 or more games. In that time, good stat or not, only Finnegan and Straily have recorded more wins for the Reds than Adleman. It’s no secret that the Reds’ rotation has been decimated by injuries in recent years, and that the team’s lauded pitching prospects have yet to achieve their potential. But when you look back at the past two seasons, which have been littered with failed veteran experiments (Alfredo Simon, Bronson Arroyo), rookies who sank when asked to swim (Cody Reed, Amir Garrett and Rookie Davis, among others) and solid seasons cut short due to injury (Anthony DeSclafani last year, Scott Feldman this year), you begin to realize how valuable Adleman has been just by showing up for work. Yes, he’s only pitched more than six innings twice in each of the last two seasons. Yes, he had a terrible July, a month in which he lost five decisions and saw his ERA rise by nearly a full run. And yes, he’s likely better suited for the bullpen, as Nick Carrington recently suggested. Still, as a starter, he’s pitched less than four innings only twice, which implies that he’s routinely thrown well enough to keep the Reds close, even if the ultimate result is no cigar. Case(s) in point: I saw Adleman pitch in person twice over the past two seasons. Last August, he started in Anaheim against the Angels, a game in which he gave up three runs and seven hits over six respectable innings in a 4-2 loss. This May, meanwhile, he pitched five innings of five-hit, three-run (one of which was unearned) ball against the Dodgers, who would go on to eat Raisel Iglesias alive as the Reds fell 9-7. In both games, Adleman wasn’t lights-out, but he pitched well enough to give the team a legitimate chance to win. Of how many recent Reds starters can you say the same thing? I was reminded of those games as I recapped Adleman’s start in Arizona on July 7. That night, as he faced off against Zack Greinke, he displayed a good command of the zone, throwing 62 of 91 pitches for strikes Ã¢â‚¬â€œ but on four different occasions when he had two strikes on a batter, he gave up run-scoring hits. 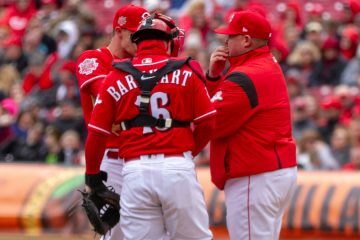 In the end, he yielded six hits and three earned runs over five innings, and the Reds lost 6-3 Ã¢â‚¬â€œ a game that, if not for four pitches, could have very well gone the other way. Indeed, on a humid, 91-degree night in Cincinnati 12 days later, Adleman and Greinke battled again. In Adleman’s best (and only quality) start of the month, he pitched six innings of seven-hit, three-run ball, outlasting Greinke (who exited after five innings) in the process. The Reds went on to win in extra innings. Soon after, it started to become clear that Adleman’s days in the Reds’ rotation were likely numbered, at least for the time being. I don’t mean to suggest that that’s a bad thing, for if the Reds finally have five healthy options who will give them a better chance of winning, I’m all for Adleman’s demotion. Still, it seems unfair not to acknowledge and commend him for being the team’s most dependable starter over the past 15 months. Perhaps in the future, we’ll look back on him in a similar manner to Travis Wood, who started 18 games for the Reds the year before they last won the NL Central (and with a very Adleman-like line at that Ã¢â‚¬â€œ 6-6 with a 4.84 ERA), or Micah Owings and Justin Lehr, who started a combined 30 games the year before the team turned the corner in 2010. Call them Band-Aids, gap-fillers, Mr. Right Nows, bridges who helped the Reds get from Point A to Point B. They might not be around when the team returns to postseason glory, but their contributions helped to pave the path leading there. If Steve Bartman gets a World Series ring, hopefully the 2018 or 2019 Reds will remember to send one Adleman’s way. 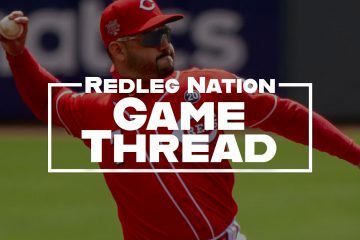 Podcast — Redleg Nation Radio #177: Will Johnny Cueto return to lead the Reds to the World Series? For the life of me, I don’t even remember the name Justin Lehr. I had to look him up. You’d think I’d remember a guy who pitched a complete-game shutout against the second-place Cubs in his second start for the Reds. Of course, I was in the middle of a layoff and had a new baby, and the Reds were in last place by that point. Maybe that’s why I have no recollection. Good post. There is a reason Adleman spent time pitching in an independent league. I’m actually surprised he stuck around as long as he has, and I wouldn’t object to seeing him pitching in the bullpen or in Louisville next year as an insurance policy should the Reds need a starting pitcher at a moment’s notice. And if the Reds are so well stocked with arms that he couldn’t crack the Bats’ rotation, that might be a good thing too. I admire and root for guys like Adleman. He’s fought and scratched with marginal ability and made it almost two years in the major leagues, or the MFL as Ted Williams would call it. A 24th-round pick, he plowed through the minors and independent leagues for almost no pay until he was 28, then has finally earned some money the last two years. I heard a thing on the Sirius XM MLB channel from Steve Phillips (the former Met GM who has a great program with Eduardo Perez) that Adleman works in the off-season at the deli where Phillips goes in the New York area. As a pitcher, hitters at this level just catch up to Adleman after the first at-bat. But maybe he has a shot in the bullpen as a long man, and there is nothing wrong with having a lot of high-character guys on the team. I can’t understand how Walt Jocketty can let a staff get this lousy. He knows how-to build and maintain a competent staff. We need a little middle relief, a ton of starters and another good hitter or two. What the heck are they waiting for. They have rebuilt a lousy team, now let’s go in the other direction awhile. This team has too much history to be this bad, five the proud REDS fans there due. I’ve been Adam since 1969. Those were the days my friend. Walt please take us back there. Call Sparky! Good post. I really couldn’t understand Price’s quick hook on Monday night – pulling Adleman with 2 outs in the 5th inning and replacing him with Blake Wood. 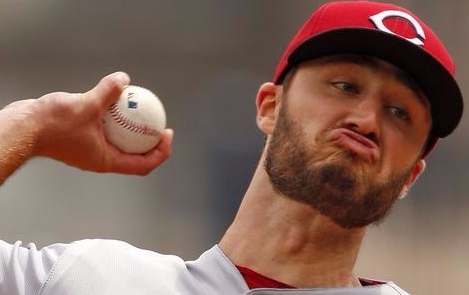 Throw the guy a bone (a chance to get the win) – Adleman might not be young or part of Reds’ future plans but he has certainly competed over the past 2 years. Also, keep in mind that the Reds didn’t plan on Adleman pitching either this year or last so who knows what the future holds.